scientific visualization, 3D animation, video and unusual communications challenges. Endeavours involving nerves and networks are especially tempting. Let us know what you're working on. Thank you for contacting Nervous Media. We will get back to you as soon as possible. 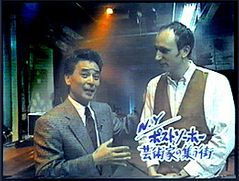 Above: Ebon Fisher (on right) with Tetsuo Suda on "OK NY," broadcast live via Fuji Television from Galapagos Art Space in Williamsburg, Brooklyn, to Japan.